College Is Child's Play. Latin Returns. Catalogue Avalanche. How the Federal Government Can Best Help Families with Children. How Missile Defense Makes the Whole Globe Safer. The Gloom and Doom Crowd Have Never Wanted Missile Defense to Work. Missile Defense Will Happen Because the People Want It. By Adhering to a Defunct Treaty, We Make Our Future More Dangerous. It Helps Revive Cities and Doesn't Hurt the Poor. Medicine Is Being Hobbled by Feminist Political Correctness. A Call for Intelligent Combativeness. Compassionate Conservatism Shouldn't Stop at the Water's Edge. America Needs an Entirely New Energy Policy. The History of Local Time. Defending America. 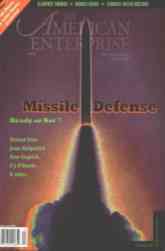 Do We Need Missile Defense? America Believes in Science. Campaign Finance and Corporate Welfare. Republican Race-Baiting? Assimilation Problems.